رجبی بهاء آبادی, مجتبی, خادمی, نوید, فروزنده, روزبه, شریعت مهیمنی, افشین. (1397). تحلیل قابلیت اطمینان زمان سفر خطوط اتوبوس با استفاده از داده‌های سیستم موقعیت‌یاب جهانی. فصلنامه علمی - پژوهشی مهندسی حمل و نقل, 9(3), 295-312. مجتبی رجبی بهاء آبادی; نوید خادمی; روزبه فروزنده; افشین شریعت مهیمنی. "تحلیل قابلیت اطمینان زمان سفر خطوط اتوبوس با استفاده از داده‌های سیستم موقعیت‌یاب جهانی". فصلنامه علمی - پژوهشی مهندسی حمل و نقل, 9, 3, 1397, 295-312. رجبی بهاء آبادی, مجتبی, خادمی, نوید, فروزنده, روزبه, شریعت مهیمنی, افشین. (1397). 'تحلیل قابلیت اطمینان زمان سفر خطوط اتوبوس با استفاده از داده‌های سیستم موقعیت‌یاب جهانی', فصلنامه علمی - پژوهشی مهندسی حمل و نقل, 9(3), pp. 295-312. رجبی بهاء آبادی, مجتبی, خادمی, نوید, فروزنده, روزبه, شریعت مهیمنی, افشین. تحلیل قابلیت اطمینان زمان سفر خطوط اتوبوس با استفاده از داده‌های سیستم موقعیت‌یاب جهانی. فصلنامه علمی - پژوهشی مهندسی حمل و نقل, 1397; 9(3): 295-312. قابلیت اطمینان زمان سفر بر عملکرد و کیفیت خدمات شبکه اتوبوس­رانی تأثیر بسزایی دارد. در این مقاله تلاش می­شود تا با استفاده از داده­های زمان سفر ثبت‌شده توسط سامانه موقعیت­یاب شرکت اتوبوس‌رانی تهران، به تحلیل قابلیت اطمینان زمان سفر بخشی از دو خط اتوبوس در شهر تهران پرداخته شود. در این راستا، ابتدا، انواع شاخص­های قابلیت اطمینان زمان سفر به‌کاررفته در پژوهش­های پیشین تبیین و تشریح می­شوند. 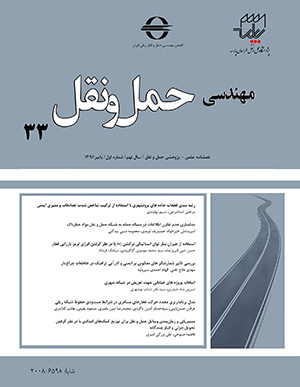 در ادامه، با استفاده از داده­های زمان سفر برداشت‌شده از شبکه اتوبوس­رانی شهر تهران، تغییرات این شاخص­ها در بازه­های مختلف زمانی روز بررسی می­شوند. علاوه بر این، میزان هم‌قوارگی چندین توزیع آماری با توزیع احتمال تجربی داده­های زمان سفر بررسی می­شود. نتایج حاصل از تحلیل داده­های زمان سفر نشان می­دهد که به‌طورکلی، تغییرپذیری زمان سفر اتوبوس در دوره اوج عصر بیشتر از دوره اوج صبح در خطوط مورد­مطالعه است. همچنین، توابع توزیع­ احتمال بور، لُگ-لوجستیک و لُگ-نرمال با دقت بیشتری می­توانند تابع توزیع احتمال زمان سفر یک مسیر اتوبوس‌رانی را تقریب بزنند. علاوه­بر این، نتایج این پژوهش نشان می­دهد که بکارگیری توزیع­های ترکیبی می­تواند میزان نیکویی برازش در تخمین توزیع داده­های زمان سفر را افزایش دهد. - Al-Deek, Haitham and Emam, B. (2006) "New methodology for estimating reliability in transportation networks with degraded link capacities", Journal of Intelligent Transportation Systems, Vol. 10, No.3, pp.117-129. - Arezoumandi, M. and Bham, GH. (2011) "Travel time reliability estimation: Use of median travel time as measure of central tendency", First Congress of Transportation and Development Institute (TDI), Chicago, United States. - Clark, Stephen D, Grant-Muller, Susan and Chen, Haibo. (2002) "Cleaning of matched license plate data", Transportation Research Record: Journal of the Transportation Research Board, Vol. 1804, No.1, pp.1-7. - Fu, Liping (2002) "Scheduling dial-a-ride paratransit under time-varying, stochastic congestion", Transportation Research Part B: Methodological, Vol. 36, No.6, pp.485-506. - Higatani, Akito, Kitazawa, Toshihiko, Tanabe, Jun, Suga, Yoshiki, Sekhar, Ravi, and Asakura, Yasuo. (2009) "Empirical analysis of travel time reliability measures in hanshin expressway network", Journal of Intelligent Transportation Systems, Vol. 13, No.1, pp.28-38. - Khademi, Navid, Rajabi-Bahaabadi, Mojtaba, Shariat Mohaymany, Afshin and Samadzad, Mahdi. (2016) "Day-to-day travel time perception modeling using an adaptive-network-based fuzzy inference system (ANFIS)", EURO Journal on Transportation and Logistics, Vol. 5, No.1, pp.25-52. - Kieu, Le-Minh, Bhaskar, Ashish and Chung, Edward (2014) "Public Transport Travel-Time Variability Definitions and Monitoring", Journal of Transportation Engineering, Vol. 141, No.1, pp.1-9. - Lam, Terence C. and Small, Kenneth A. (2001) "The value of time and reliability: measurement from a value pricing experiment", Transportation Research Part E: Logistics and Transportation Review, Vol. 37, No. 2–3, pp. 231-251. - Lim, Tjen-Sien and Loh, Wei-Yin (1996) "A comparison of tests of equality of variances", Computational Statistics & Data Analysis, Vol. 22, No.3, pp. 287-301. - Ma, Zhenliang, Ferreira, Luis, Mesbah, Mahmoud and Zhu, Sicong (2016) "Modeling distributions of travel time variability for bus operations", Journal of Advanced Transportation, Vol. 50, No.1, pp. 6-24. - Martchouk, Maria, Mannering, Fred and Bullock, Darcy (2010) "Analysis of freeway travel time variability using Bluetooth detection", Journal of Transportation Engineering, Vol. 137, No.10, pp. 697-704. - Mazloumi, Ehsan, Currie, Graham and Rose, Geoffrey (2009) "Using GPS data to gain insight into public transport travel time variability", Journal of Transportation Engineering, Vol. 136, No.7, pp. 623-631. - Montgomery, Douglas C., Runger, George C. and Hubele, Norma F. (2010) "Engineering statistics", 5th edition , John Wiley & Sons. - Polus, Abishai (1979) "A study of travel time and reliability on arterial routes", Transportation, Vol. 8, No.2, pp.141-151. - Pu, Wenjing (2011) "Analytic relationships between travel time reliability measures", Transportation Research Record: Journal of the Transportation Research Board, Vol. 2254, No.1, pp.122-130. - Susilawati,??? ?, Taylor, Michael A. P. and Somenahalli, Sekhar V. C. (2013) "Distributions of travel time variability on urban roads", Journal of Advanced Transportation, Vol. 47, No.8, pp.720-736. - Taylor, Michael A. P. and Susilawati (2012) "Modelling travel time reliability with the burr distribution", Procedia - Social and Behavioral Sciences, Vol. 54, No.1, pp.75-83. - Van Lint, J. W. C., van Zuylen, Henk J. and Tu, H. (2008) "Travel time unreliability on freeways: Why measures based on variance tell only half the story", Transportation Research Part A: Policy and Practice, Vol. 42, No.1, pp.258-277. - Yao, Baozhen, Hu, Ping, Lu, Xiaohong, Gao, Junjie and Zhang, Mingheng (2014) "Transit network design based on travel time reliability", Transportation Research Part C: Emerging Technologies, Vol. 43, Part 3, pp.233-248. - Yazici, M. Anil, Kamga, Camille and Mouskos, Kyriacos C. (2012) "Analysis of travel time reliability in New York city based on day-of-week and time-of-day periods", Transportation Research Record: Journal of the Transportation Research Board, Vol. 2308, No.1, pp.83-95. - Yuan, Jing, Zheng, Yu, Zhang, Chengyang, Xie, Xing, and Sun, Guang-Zhong (2010) "An interactive-voting based map matching algorithm", Eleventh International Conference on Mobile Data Management, Kansas, USA.